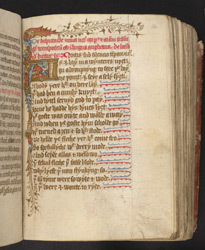 This manuscript contains of a variety of devotional texts; mostly Latin prayers and English hymns. It was probably compiled for (and by?) John Northewode, a monk of the Cistercian abbey of Bordesley, near Redditch in Worcestershire. The English verse on this page, introduced by the illuminated initial 'A', begins 'As I lay in a wynteres ny3t [winter's night] . . .'.